With all the hullabaloo over the dearly departed Comet ISON, it is now time to get our imaging gear ready for the next comet of the century, or just another one visiting the inner solar system. 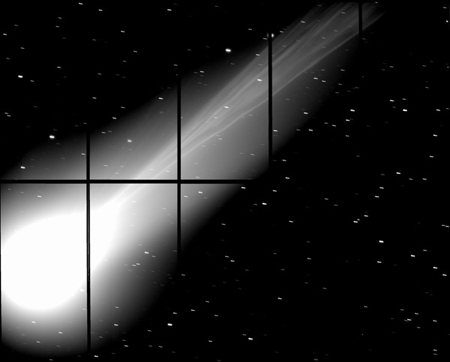 This article compares the efforts of amateur imagers with ISON vs. the great Subaru telescope in Hawaii, with its wide-angle capacity, imaging Comet Lovejoy. Surprisingly, the results are not what one would expect. Here are two images, the first of Comet Lovejoy from the Subaru, and the second is of ISON from an ordinary amateur, Damian Peach, using a 106mm lens. As you can see, the second image is even wider than what the longer focal length instrument could provide, even with stitching together several images. The Subaru image is magnificent. However, the amateur image is in my opinion the best comet image ever taken. Why? Because the background is sharp, showing faint galaxies and double stars; as well as fascinating detail of the tail. Subaru tracked its comet for 180 seconds, blurring the background. 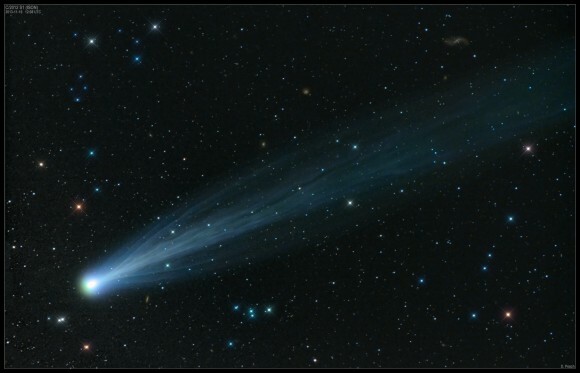 Let's return to optical basics: The naked eye sees at 1X power; so our only advantage while naturally viewing comets is to see a sharp stellar background, and a long tail without much detail. Relative to the naked eye, a low-power scope will offer superior light gathering capacity, and still a sufficiently wide field of view. Most importantly, if the imager chooses to track the background stars while imaging the comet, apparent sharpness rules everywhere. Why? Simply because the comet won't move much in a very few minutes. At worst, its head will appear slightly elongated. The tail's shape will retain most of its integrity, as the comet's motion is parallel to the tail, not perpendicular. More basic optics: Film and even CCD imaging has to deal with contrast ratios. Where an image contains both bright and very dim objects, the imager must favor one or the other. Our naked-eye pupils' muscles, and sharp fields of view within the wider natural field of view, adjust so rapidly, and below consciousness, that we imagine most everyday fields of view to have less contrast than they really do. This is a prime example of mental viewing vs. machine viewing. In the Subaru's case, their astrophotographers chose to take one shot of 180 seconds, which was ideal for showing the tail, but which was vastly overexposed for the head, and horrible for the background. It looks like an old school image. The amateur using a comparably wimpy instrument did this: Comet ISON on Nov. 15, 2013, 106mm F5.0 with STL-11k. LRGB. L: 5x2mins. RGB: 1x2mins. This means the tracked star field is tack sharp, and the comet hardly moved at such low magnification. Result: sheer beauty, and still good science. Obviously, the Subaru is far superior to any amateur instrument for many objects, and should be for this object from a strictly scientific perspectieve. To get more science, they would need to take very short images of the head of the comet at higher powers, and with different filters. They could save the tail details for other efforts, such as the one they published. Since the pros are artisans focusing on the object, and not artists focusing on the object within its field, I doubt that they considered the experience of seeing smeared stars, vs. tack sharp stars and background deep sky objects. I am sure the artisans have taken better images of the Lovejoy head, which they chose not to publish concurrently. In contrast, the beautiful amateur ISON image has it all (with fewer head details) for public consumption.